Add Tormek Anti-Corrosion Concentrate to water at a ratio of 10ml of concentrate to 250ml of water before filling the trough of your Tormek sharpener. The water trough holds about 500ml, so that's 20ml of concentrate every time you fill up the trough. The water can be saved for reuse. Remember to lower the trough so the wheel is not sitting in the water when not in use. The Anti Corrosion Concentrate does not contain anti freeze. Each of the two 150ml bottles is conveniently marked with a scale for accurate dispensing. At a ratio of 10ml concentrate to 250ml water, there is enough concentrate in a package to fill the water trough of a T8 fifteen times. Recommended for use with use with the DC250 Coarse, DF250 Fine and DE250 Extra Fine Diamond Wheels. 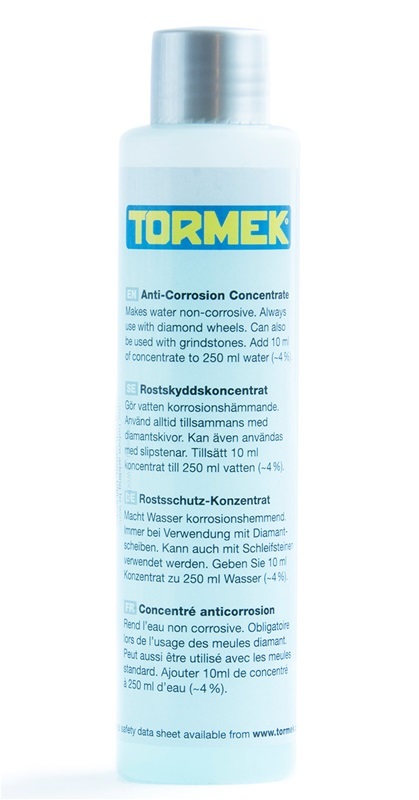 The Anti Corrosion Concentrate can be used with any Tormek Grinding Wheel.